Electric scooters, mopeds, and motorized bicycles seem to be taking over California streets. Services like Bird and Lime offer a ridesharing service using these devices and a “dockless” system, allowing users to simply leave their rented vehicles in a safe location after finishing with them. However, despite the ecological benefits of encouraging green alternative transportation in major California cities, these electric vehicles are causing several significant issues. All California residents should understand the new laws in effect before using these ridesharing services. The main problem with the proliferation of electric rideshare bikes and scooters in California is pedestrian displacement. Many California pedestrians complain that these rideshare vehicles are taking over sidewalks, essentially pushing pedestrians out of the way and exposing them to potentially serious injuries. Many pedestrians also cite poor parking etiquette as an issue with rideshare scooters and bikes. While the services providing these vehicles instruct users to park them safely out of the way of foot traffic when finished, many users simply leave their used bikes and scooters on the sidewalk, in front of business entrances, and on curbs. The San Diego Active Transportation & Infrastructure Committee (SDATIC) recently addressed these issues by unanimously passing new regulations on rideshare services for electric scooters and bikes. One of the new regulations involves geofencing, or the partitioning of the local area ensuring rented electric vehicles can only travel at low speeds in some areas. Remote-controlled geofencing allows companies to slow their vehicles to 8mph in areas like the Pacific Beach and Mission Beach boardwalks. In the Martin Luther King Jr. promenade downtown, companies must use geofencing to slow their vehicles down to 3mph. Another regulation pertains to parking or staging areas for bikes and scooters not in use. The new SDATIC rules state no more than four staged vehicles may remain in a 40-foot area. This aims to eliminate “bike piles” and obtrusive clusters of parked electric scooters. SDATIC aims to keep these vehicles easily accessible near bus and trolley stops without impeding the flow of foot traffic in these areas. 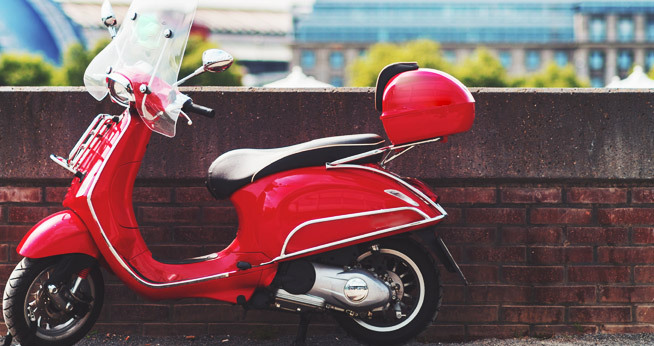 The SDATIC also requires a per-device fee for each bike or scooter kept in a specified area and liability insurance for accidents involving these vehicles. Ultimately, the goal of these new regulations is to protect pedestrians, more evenly distribute green rideshare vehicles, and help riders navigate California streets more safely. The new regulations imposed on electric scooter and bike rental companies encourage greater responsibility, and the revenue earned from the device fees can help augment the city’s existing transportation budget. California does not allow motorized vehicles on sidewalks. Any moped, motorized scooter, or motorized bike with an engine requires a valid motorcycle license for use. Additionally, these vehicles must remain on the road like bicycles and other vehicles with some exceptions based on engine size. Anyone who rides these vehicles in California must abide by the traffic laws, and some of these vehicles may not enter highways. A moped or motorized bike with a small motor capable of no more than two gross brake horsepower or an electric motor capable of no more than 30mph does not require a motorcycle license for use. However, riders must be over the age of 16, wear appropriately-fitted helmets, and may only ride on streets with speed limits of 30mph or lower. Electric vehicle sharing programs like Lime and Bird have received a warm reception throughout California as the state seeks to reduce fossil fuel consumption and embrace more alternative transportation options. Rideshare bike and electric scooter users should carefully review the terms and conditions for use of these services before operating these vehicles and use good judgment when riding and parking these vehicles. The laws are likely to change in the near future as electric scooter and bike sharing services reach more California communities.